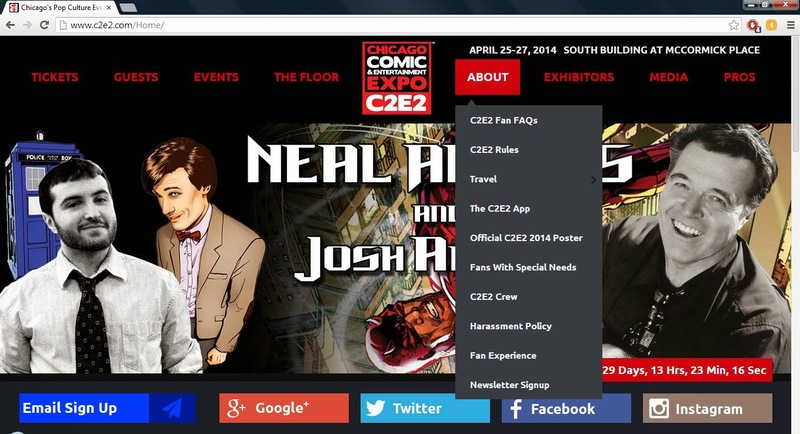 Towards the end of April, the ReedPop group will be running their C2E2 event in Chicago. I went last year for the first time and was impressed, so I've signed up again for this year. Graphic Novels: Super Classroom Tools of Tolerance and Taming Aggression! That's a fair chunk of time devoted to inclusion and tolerance. And while the "Gay Character and Creators Panel" seems to go a bit down the "Women in Comics" route, for the most part, they're dealing with a combination of outreach and getting people to understand and act on discrimantory problems we have in the industry. Not only is their Harassment Policy clearly delineated, but there's also a prominent link for "Fans with Special Needs." Not only do they talk about things like wheelchair access and guide dogs, but they even have accommodations for people who require medicines that need to be in cold storage. The idea of a convention having a formal harassment policy has cropped up in the past few years and, while it's not exactly common yet, it's not uncommon either. I think this is the first con where I've seen such explicit mention of special needs fans as well, though. (Admittedly, it has never been something I've actively looked for in the past.) I want to point this out because it's another aspect of inclusion that gets overlooked frequently and, despite not garnering the popular attention that harassment has, ReedPop was still prescient enough to bring it to the fore on their own. So while we still have plenty of issues to address in comics, I find it incredibly encouraging to see shows take more progressive steps like this out of the basic idea of doing the right thing for its own sake than out of any pressures that might come from their constituents. Let's see more of this, please! Oh good grief, I hope they aren't heading down the 'Elevatorgate' route where asking someone for coffee is a crime. A lot of people hook up at cons, sometimes they even marry! Some Politically Correct Feminist Agenda to crush all flirting and squeeze all the joy from life - ugh. I really hope the cons aren't going down that path. "Genre Feminism .. That's a fair chunk of time devoted to inclusion and tolerance. " Feminism is a movement that actively harms men. I've always been really impressed with C2E2's programming and this year was really fantastic, though I hope they have more panels supporting racial diversity next year. I moderated Creating Community: Hosting Ladies' Night at Your Local Comic Shop, so thank you for spreading the word ahead of time. Here's a video of the panel if you were not able to attend!